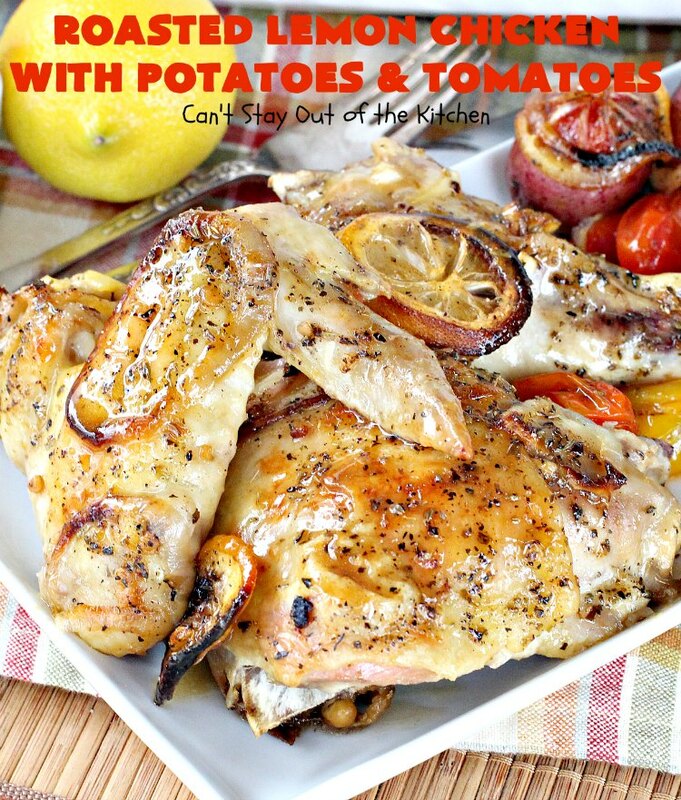 I absolutely LOVE, LOVE, LOVE Roasted Lemon Chicken with Potatoes and Tomatoes! First of all, it’s really easy! You toss some meat and veggies into a baking dish, mix up a few ingredients to pour over them, and then bake. Yes, E-A-S-Y! Second, this recipe really tastes scrumptious. Really. Third, You have a complete meal in one dish! You don’t have to prepare anything else unless you just really want to. I made the Balsamic Yellow Squash Bake as a side dish for this entree, but it would have been perfectly fine without it. Roasted Lemon Chicken with Potatoes and Tomatoes is a flavorful, savory recipe that’s low calorie, gluten free, and healthy! This is pretty much a clean recipe for those who are trying to stay away from processed foods. I’m always on the hunt for clean main dish recipes, as it seems that so many of my old family favorites were made with canned soups and other processed foods filled with all kinds of fillers. I try to eat those dishes infrequently because of all the MSG, corn syrup, and other fillers that seem to spike my blood sugar levels a lot. So, I’m always grateful for others who share their favorite recipes online that are delicious, easy, but also clean. If you’re looking for a fabulous go-to main dish recipe than by all means consider Roasted Lemon Chicken with Potatoes and Tomatoes. It’s a quick, easy and economical one-dish meal your family is sure to enjoy. It’s also a great way to use up all those cherry tomatoes from your garden during the summer! If two of your favorite foods are potatoes and tomatoes (like me), this is a double yum recipe! When I first published this recipe in December 2013, I was concerned that the recipe not get overly browned because the pictures from the original recipe looked a little crispy and overly browned. So I covered the casserole while baking it. Unfortunately, that meant that the chicken did not brown enough. I also over-crowded the baking dish so it took longer to bake. I really love this recipe so I decided to remake it (January 2015). This time I used a whole chicken cut up so I could get pictures of different pieces of meat. But because the chicken breasts were so huge I spread the ingredients out over two large 10×15″ glass baking dishes (or two roaster pans). I never covered the chicken and didn’t feel that my entree got too browned even though it cooked almost two hours. I cooked the entree without the tomatoes for 45 minutes and then added the tomatoes for the remainder of the baking time. 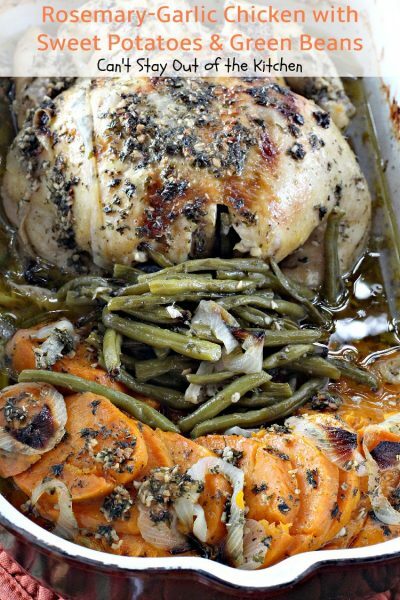 It was succulent, delectable and amazing just like the first time I made it, but had a richer broth because of using dark meat with skin on instead of just boneless, skinless, chicken breasts. I also took a few new pictures so you can drool over this tasty chicken dish. 🙂 This dish is so worth making. The sauce itself is great to put on any kind of meat. 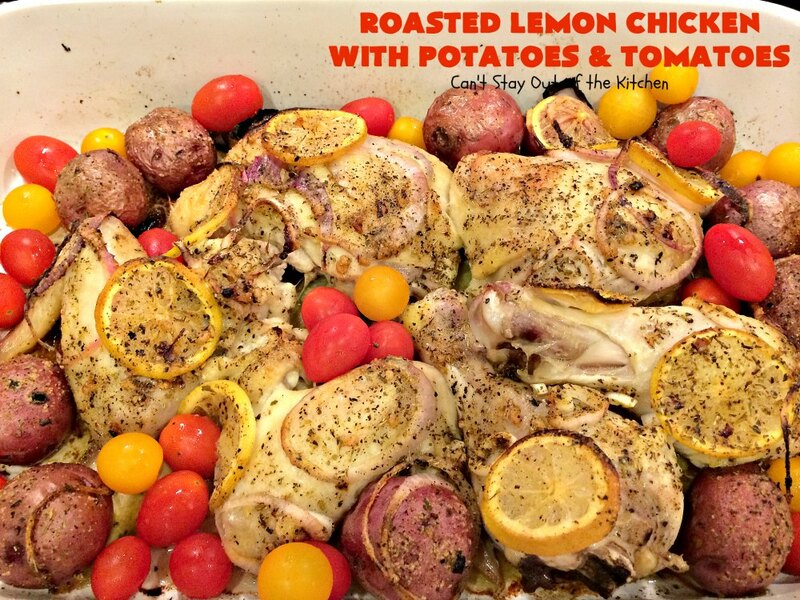 We really enjoyed Roasted Lemon Chicken with Potatoes and Tomatoes when we served it for company a few weeks ago, and I believe you’ll enjoy it too! 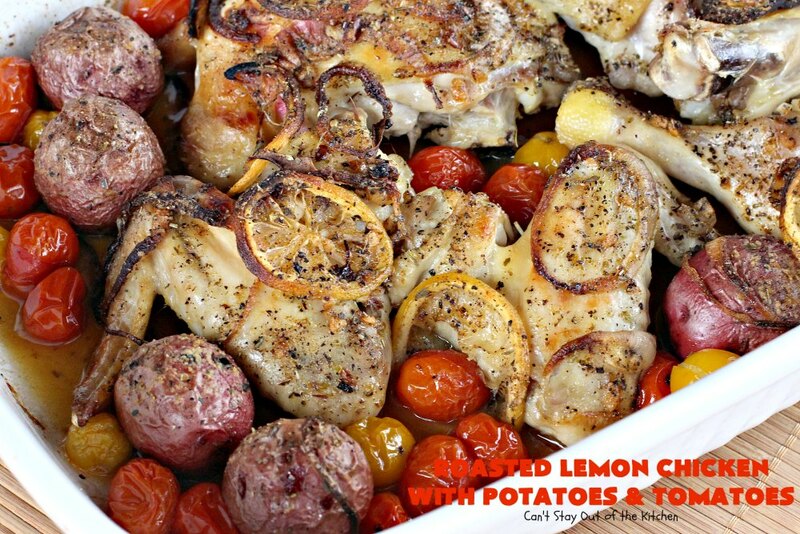 Roasted Lemon Chicken with Potatoes and Tomatoes is a spectacular main dish entree. 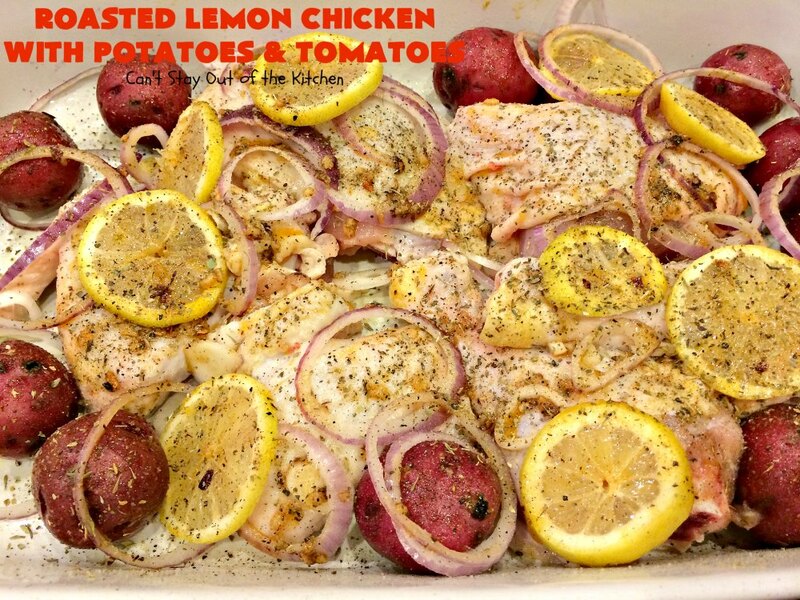 Here’s a serving of the chicken with a side of the potatoes, tomatoes, and lemon slices. You can drizzle more lemon from the lemon slices over everything if you like. I basted the chicken and veggies with extra broth/sauce from the bottom of the baking dish. We loved this fantastic chicken recipe and think you will too! Mix olive oil with seasonings and garlic. Set aside. Spray two large 10×15″ glass baking dishes with olive oil cooking spray. Spread your meat in the dish. 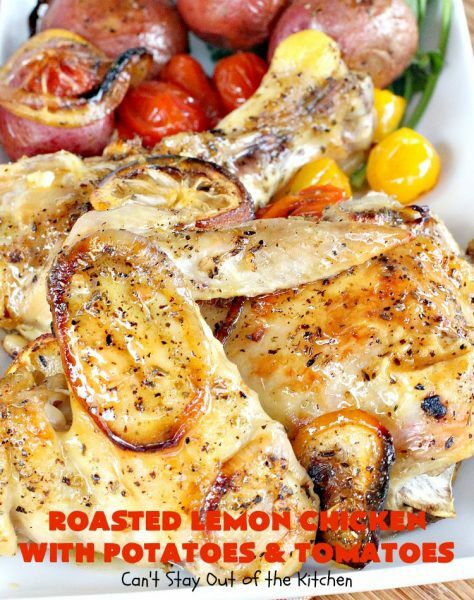 I’ve used boneless chicken breasts and a whole cut-up chicken in this recipe. Even chicken thighs will work fine. 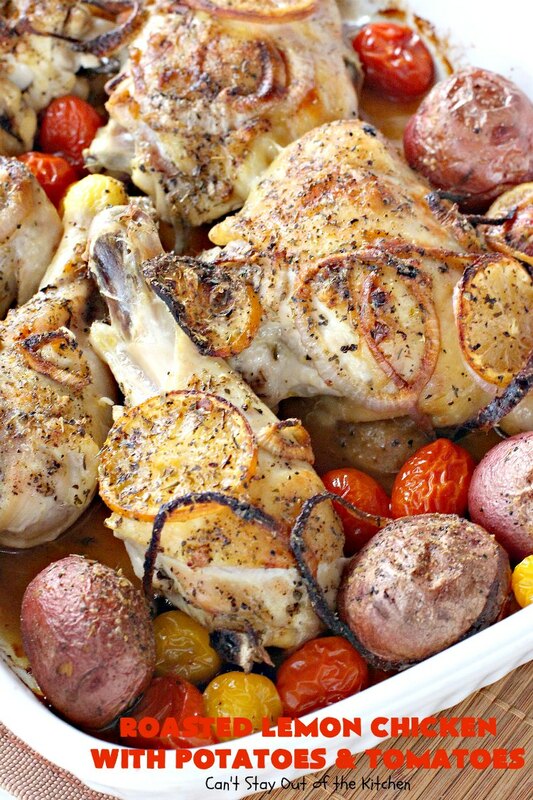 Place petite red potatoes around the outside of the chicken. Add red onion rings and lemon slices. 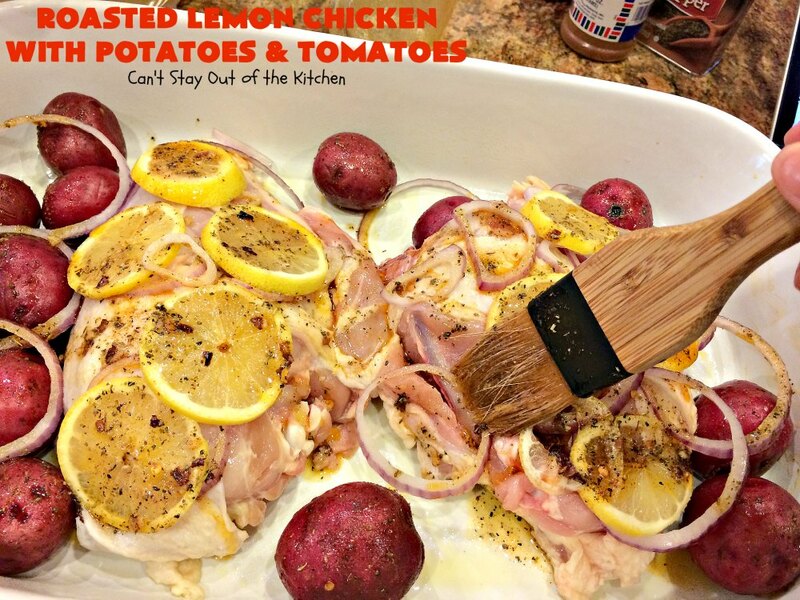 Brush olive oil mixture over top of chicken, veggies and lemons. Sprinkle mixture generously with more salt, pepper, and Italian seasoning. Bake, uncovered, at 350 for about 45-60 minutes. Add tomatoes. I used both grape tomatoes, and sunburst cherry tomatoes. 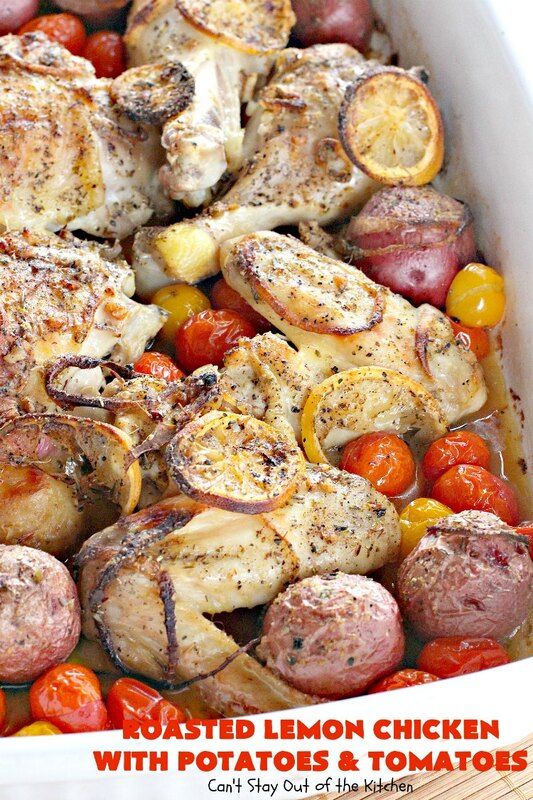 Bake an additional 45-50 minutes or until chicken is cooked through and tomatoes are soft. Baste chicken and veggies with some of the broth/sauce from the bottom of the baking dish before serving. There are plenty of veggies here for hearty servings. You can cut them back if you don’t want or need quite that much. The Italian seasoning really adds a lot of flavor. I have a feeling Roasted Lemon Chicken with Potatoes and Tomatoes will become one of our family favorites. I didn’t stir the casserole before serving, but moving the veggies off the top of the chicken will help the pieces brown better. Fabulous chicken entree with lemon and onion slices, red potatoes, tomatoes in a delicious olive oil, garlic and lemon sauce. It's healthy, low calorie and gluten free. It's so quick and easy that it's the perfect one-dish weeknight dinner. Also terrific for company or holiday dinners like Easter, Mother's Day or Father's Day. Spray two large 10x17” baking dishes with olive oil cooking spray. Place chicken pieces into the dishes. (Avoid overcrowding). Place potatoes around the edge of the baking dish. Arrange red onion rings over top of chicken and potatoes. 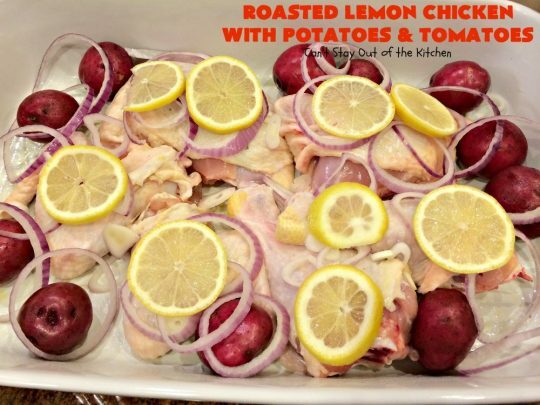 Slice two small lemons thinly, and place over top of the chicken and potatoes. 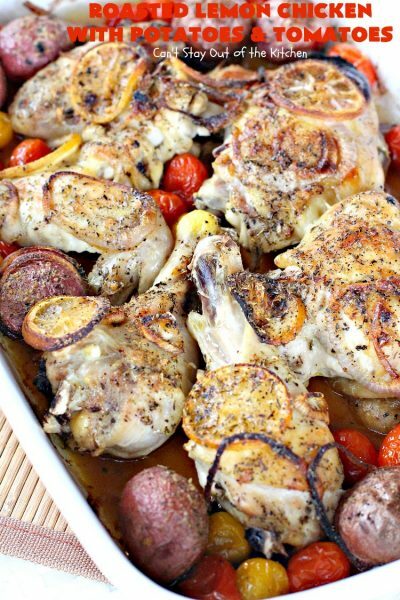 Bake an additional 45-60 minutes or until tomatoes are soft and chicken is cooked through. (Some larger pieces may take longer). NOTE: If food starts browning too much, tent with foil after about 60 minutes. NOTE: Because the chicken breasts were so huge they took up almost the whole baking dish, I spread the mixture into two 10x15” glass baking pans so the meat would not be crowded and cook more quickly. NOTE: Remove lemon slices before serving. Fabulous chicken entree with lemon and onion slices, red potatoes, tomatoes in a delicious olive oil, garlic and lemon sauce that’s healthy, low calorie and gluten free. Spray two large 10×15” baking dishes with olive oil cooking spray. If food starts browning too much, tent with foil after about 45 minutes. [br][br]Because the chicken breasts were so huge they took up almost the whole baking dish, I spread the mixture into two 10×15” glass baking pans so the meat would not be crowded and cook more quickly. [br][br]Remove lemon slices before serving. 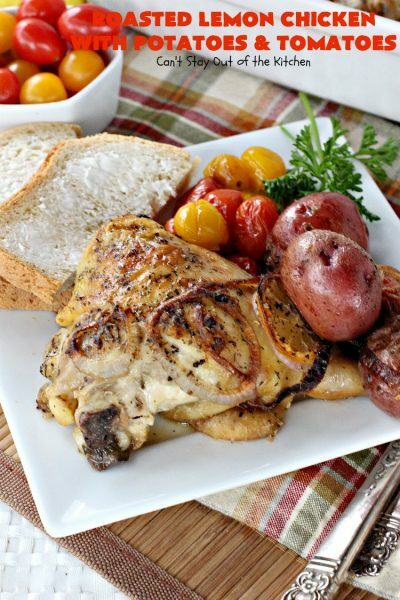 Roasted Lemon Chicken with Potatoes and Tomatoes is a terrific recipe for company or holiday dinners like Easter, Father’s Day or Mother’s Day. The chicken is very tender and delicious. 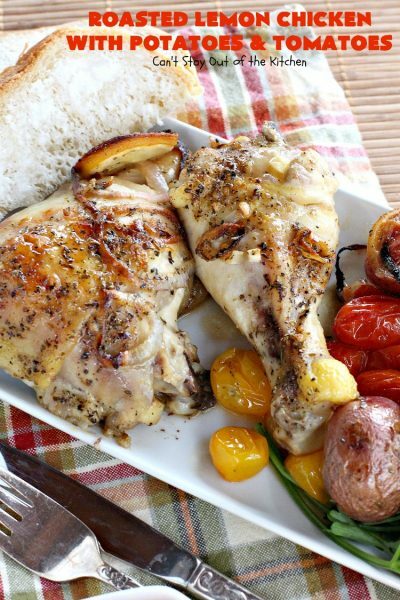 Garlic, red pepper, paprika, Italian seasoning, olive oil and lemon flavor this savory dish in an amazing way. 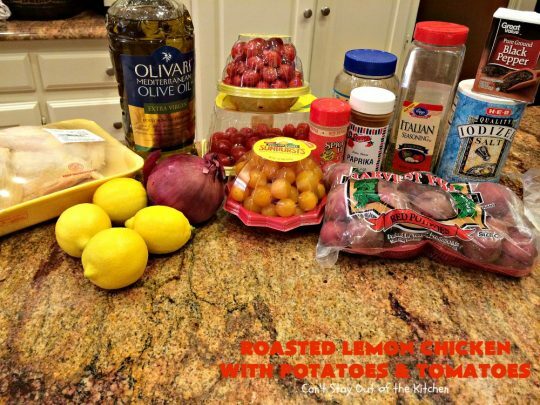 Roasted Lemon Chicken with Potatoes and Tomatoes is a healthy, low calorie, clean eating gluten free recipe you can enjoy without guilt! I have made something similar to this recipe but in addition to the above you can also add a can of pitted black olives. Delish. I love that idea, Rose. I think I may try that the next time I make it. Thanks for sharing. Hi there! 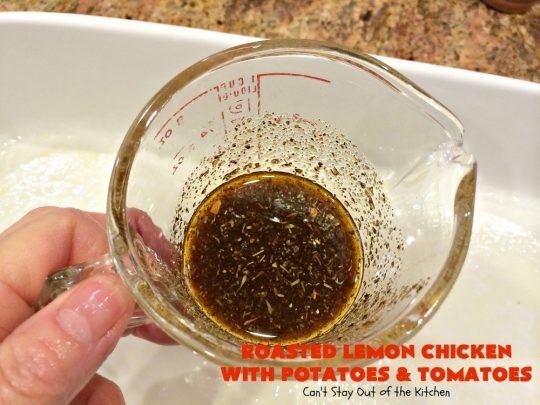 Loved this recipe, so I had to link to it on my healthy recipes weekend roundup. It looks terrific and so colorful. Kristi, it is so good. I’ve made it several times and made several different versions. Thanks for linking it to your weekend roundup. It’s no longer available, Tamara. We removed WordPress’s Jetpack option because it was slowing the blog down so much and the like button went with it. Thanks again for liking the recipe. This is one I think your family would really enjoy.